WikiBranding: Why I love what I do. First of all, I work in a profession that sits at the intersection of business and everything – technology, art, pop culture, entertainment, societal trends, media. How can you not love that? I get to solve business problems that help companies grow. I try to never forget why we do what we do. I get to live each week as a commercial anthropologist. 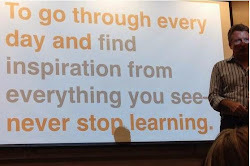 The inspirations I need are constantly swirling around me, whether I'm on Facebook witnessing nascent online memes, seeing a new special effect in a movie, learning about new technologies in Wired, scanning relevant business trends in the Wall Street Journal, or walking through the grocery store and watching how people shop (creepy, I know). I get to have weeks like the one I just had – one that reminds me that I actually have multiple careers: I work in fashion (reviewing fashion trends for Charming Charlie); spirits (digging for insights for SKYY on why women love flavored vodkas); fine jewelry (working with teams to define the true meaning of "love at first sight" for Tacori); travel (discussing positioning for Cunard Cruises); and bottled water (exploring angles on health and wellness for Dasani). I get to engage in conversations about "what's next" – exploring new ways to link social media to retail; vetting new applications of interactive technologies in retail stores; investigating how Millennials value corporate social responsibility. I get to inspire the next generation of talent, whether doing one-on-one training or preparing for next week's talk at Chapman University. Most of all, and this has always been true, I get to work with really interesting, smart, curious and fun professionals. Thirty years on, I love what I do. This week was just another one of those weeks. What marketers can learn from the election.